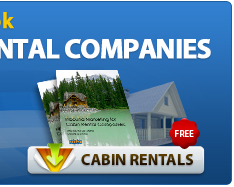 The point of Internet marketing for vacation rental companies is, of course, to book more rentals. Companies often find it difficult to make website traffic translate into sales, though. The solution to this problem is lead generation through marketing automation workflows. Workflows generate return traffic to your website, build your email list, provide content that shows you are the expert in your area, and ultimately convert website traffic into leads and renters. Not sure how your vacation rental company can use workflows to nurture leads into renters? Find out what a workflow is and how they can benefit your vacation rental company! Once a website visitor submits a form, the workflow process begins. Based on the form they have downloaded, they will receive follow-up emails over a period of time that include additional helpful information that would help a prospective vacationer decide to book with your company (see example below). These follow-up emails drive visitors back to your website and keep your company top-of-mind as they form their vacation plans. Here’s an example of a workflow that would be useful for a vacation rental company. Imagine that you published a blog post on your website called “10 Free Things to Do with Your Family in Destin, FL.” Here’s how a workflow would work. Within that blog post, you include a graphic call-to-action that invites the reader to download a free eBook called, “A Guide to Choosing the Perfect Destin Vacation Rental for your Family.” This topic is good top-of-funnel content because it speaks to the prospect who is at the beginning of their vacation planning process. Visitor later receives an email and downloads “middle-of-funnel” content. Once the reader fills out a form to download this guide, he or she is placed into an automated workflow created using marketing automation software. Now, the reader will receive additional helpful information from your company over time. For example, two days later your workflow could automatically send the reader an email to download another eBook called, “10 Things to Look for When Choosing a Destin Vacation Rental Company.” This is good middle-of-funnel content because it helps the prospect get further into the decision-making process. When the prospect receives this email, they would then click on a call-to-action within the email and be taken to a landing page on your website with a new submission form. This form would contain a specific question, such as “What type of Destin vacation home interests you?” You would then offer several options for answers, such as oceanfront home, semi-oceanfront home, etc. Visitor receives another email and acts on the “bottom-of-funnel” content. A few days later, your workflow would then send the prospect an email including a link to specific types of homes that meet that prospect’s needs based on the answer they provided in their last submission form. At this point, the prospect has received valuable, free information from you that is truly helpful, which has fostered a positive relationship between you and the prospect and kept you top-of-mind during their vacation planning process. Because you have this relationship and level of awareness, the prospect is much more likely to choose you rather than your competition. Why Are Workflows Beneficial for Vacation Rental Companies? When a lead in your workflow consumes your bottom-of-funnel content, marketing automation software will notify you and a reservationist can then follow-up with that lead. Through this process of automated lead generation and nurturing, marketing automation workflows solve the problem of converting website traffic into bookings that hit your bottom line. Want to learn more about workflows and the inbound marketing process for vacation rentals? 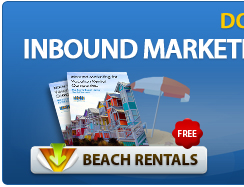 Click the graphic call-to-action below to learn how inbound marketing can help your specific vacation rental company! This entry was posted in Internet Marketing, Vacation Rental Marketing. Bookmark the permalink.